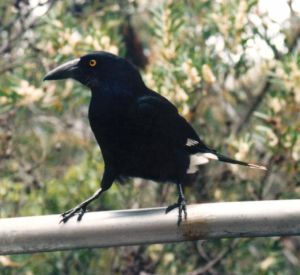 A large, almost all black bird, with some white on the wing which is more obvious during flight. The eyes are an intense yellow and like to look at you if you're eating something yummy outdoors. Their call is like their name: a beautifully echoing, rolling "Curra-wong! Curra-wong! ", with variations and different accents in different regions. The east coast; seems common in the highlands of the Great Dividing Range.